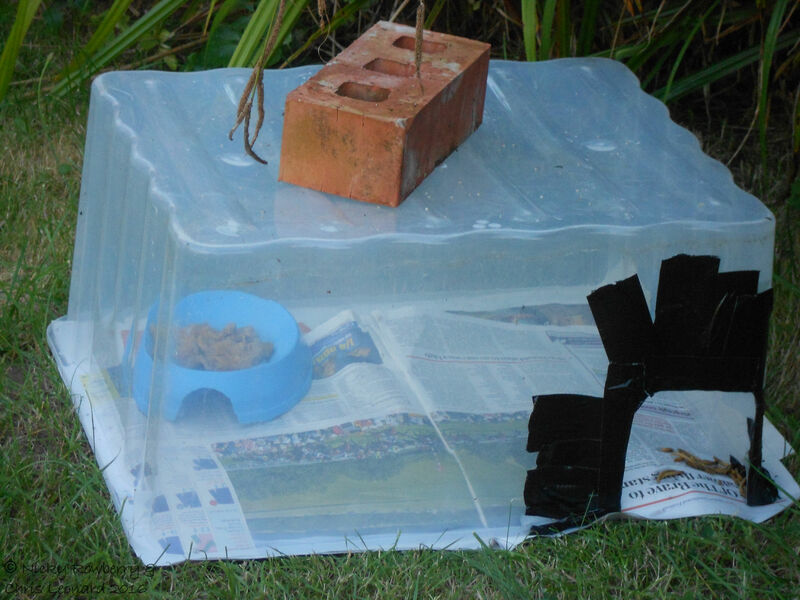 The idea behind the feeding station is simple enough – provide a safe place for the hedgehog to eat with an entrance hole too small for the cats to get in. I’m not the most DIY-minded person, but thought I could just about manage this! So one plastic box, a pair of scissors, some sticky tape and a brick later, this was the result! It may not be a build of great architectural beauty, but I was hoping the hedgehogs wouldn’t be too bothered by the aesthetics (or the choice of reading material I’d lined the bottom with). The catfood went at one end, but I also put a few mealworms near the entrance to try and tempt the hedgehogs to investigate further. The trail cam was set up and I just had to wait for morning to see if it worked. In the morning I was really chuffed to find that the food had all been eaten – of course the question was – Who or What ate it? 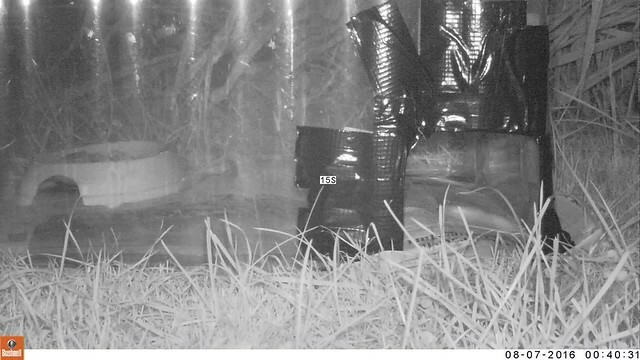 Trail cam footage first showed the usual cunning cat peering at the box and looking mildly annoyed that it couldn’t get to the food. 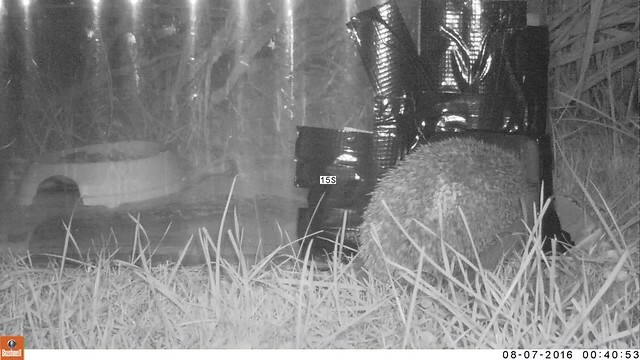 Then at about 12:40 am the hedgehog appeared to view my handiwork for the first time. Then followed a few more nervous entries into the box until by 3am our hedgehog was striding in and going straight for the food. Clearly his or her confidence was such that by the morning all the food had gone. I am so pleased with this – it has way exceeded my expectations, especially for a first night trial. I’ve stocked up on catfood and hopefully this success will continue throughout the summer. The only slightly annoying thing is that my trail cam will only record 15 seconds at a time when in night-time mode, but I can live with that. I can’t thank Little Silver Hedgehog enough for her excellent advice (do check out her blog for all things hedgehog related https://littlesilverhedgehog.wordpress.com/) and Paula on Twitter for pointing me in the right direction in the first place. Social media working at its best! ← Out and About – Prestbury Hill – The Return! So pleased you found the blog useful and great to see it being put into action and with such a fantastic result! I’m just so pleased I found your blog – you’ve got so much useful info on there for the hedgehogs – brilliant! Brilliant. Well done. I am now encouraged to try. Thanks, but I can’t take credit – it was all thanks to the instructions on Little Silver Hedgehog’s blog. You should definitely give it a go though – very easy and well worth it. 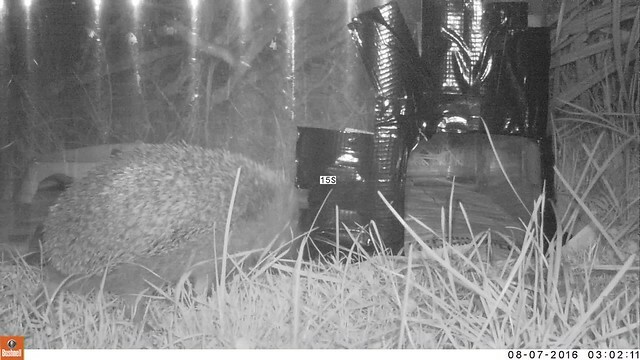 My plastic box feeder (under the bed shape) has been in situ for 4 nights but our new resident hog( about 2 weeks) has not used it. He was feeding g every night from an open dish but with so many neighbourhood cats we had to look for an alternative. Any suggestions as to how to encourage him? Hi Maggie. My hedgehogs seem to have gone off the plastic box a bit too – maybe it’s the weather. They do go mad for dried mealworms – maybe you could try a few of those in the box? The cats won’t eat them at least! Hi! Thanks for getting back to me. Ihave put a trail of mealworms from the entrance to the bowl but it hasn’t worked. Well hopefully it’s a good sign that your hedgehog is getting enough food elsewhere? Have you tried asking the lady at Little Silver Hedgehog for some tips – that’s where I got advice from in the first place – https://littlesilverhedgehog.wordpress.com/ The main thing is probably that the food is there if your hedgie needs it, so don’t give up. Hi. I was pretty much copying everything that “Little Silver Hedgehog” did on her blog. She’d suggested lining with newspaper and it certainly made it much easier to clean out each morning. Just whip out the old paper and line it with fresh stuff. The hedgehogs didn’t seem to mind it and we don’t get too many slugs. Wow never heard of that – thanks. Thanks Cath. That’s a great idea re the cat weekend feeder, I might try that next time we are away. The local moggies used to streeeeeetch in and hook the bowl to the entrance, so I made an L- shaped tunnel out of odd pieces of wood, which has flummoxed them.